My new web adress is www.wackycomics.com!! So, what else are you likely to find lying within the petrifying pages? Well, you may spot Bob the skull's missing eyeball, 13 dragons, some evil marshmallows and discover just what is down at the centre of the Earth! 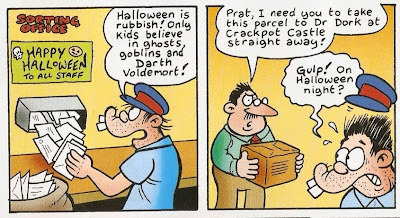 Postman Prat makes a special delivery to Doctor Dork at Crackpot Castle! Just what is it inside that blood-curdling box of his? In the the second box (shown below) I thought that Prat would be saying: "Gulp! On Halloween night? 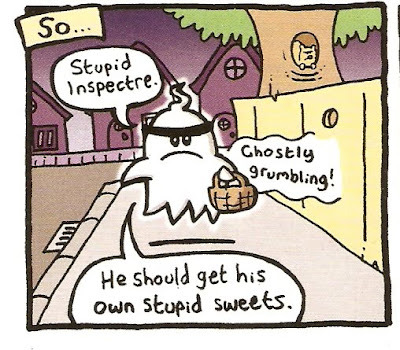 But there could be ghosts, goblins and... and Darth Voldemort!" 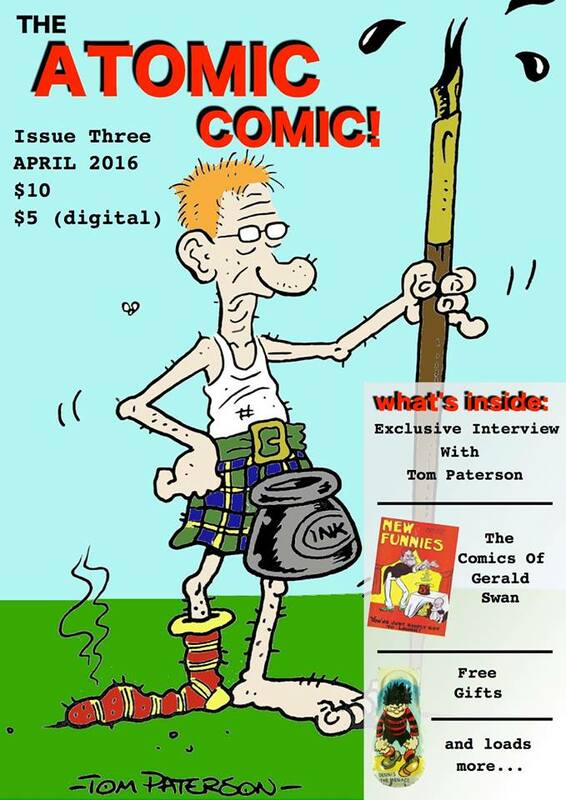 All that and much, much more only in this spine-tingling special issue! Only a scary £1.50, in shops nationwide! 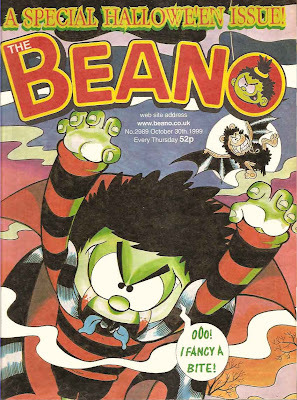 We now await the halloween Beano. So the cover features Cheeky cutting through one of Auntie Daisy's (The school dinner lady) 'cement' cakes (or some other completely solid substance), yet more brilliant artwork from the pen of Frank McDiarmid!Then I opened up thecover,and noticed that on page three which has January with Cheeky,has no price in the clipcorner! It is simply an empty triangle! Just to make sure that this wasn't a one off mistake I double checked with my tattier Cheeky annual of the same year. It was exactly the same! 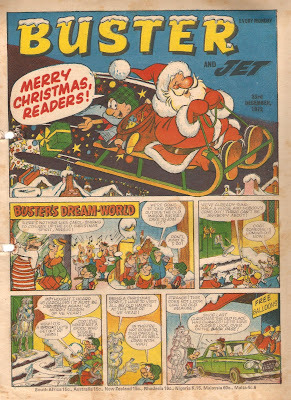 Here's my copy of a christmas Buster comic, dated 23rd December 1972. 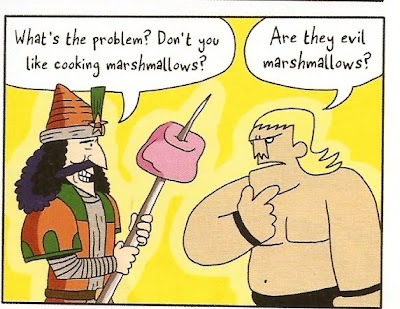 And now compare it with the image from www.bustercomic.co.uk. See the difference? Their issue has a price on it under 'Every Monday' of three and a half pence, whereas mine doesn't!? 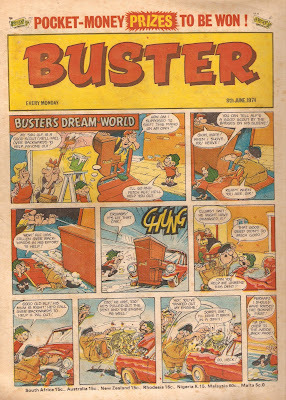 And it's the same story with my other Buster comic from around that time! 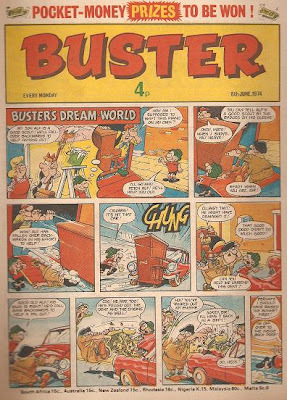 This issue from 1974 should have a price of 4p written in the centre under the Buster logo, but instead there is just a blank space? And in both these issues it clearly states: "BUSTER and JET must not be sold at more than the recommended selling price shown on the cover." Explanations, anybody? Anyway, were getting a bit side-tracked, so lets return to Cheeky! So now I move onto colouring. 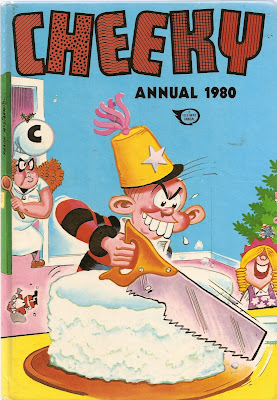 Of course, unlike today's comics, this annual isn't printed in full colour. Printing anything in full-colour back then would have cost a lot of money. 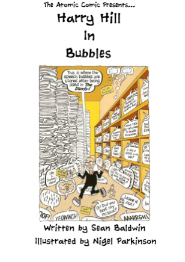 (If you want a black and white 80's feel annual try this years Viz. )Looking through the thirty odd pages that are in colour (its a 128 page annual if you include the covers), I thought that the colouring was excellent. 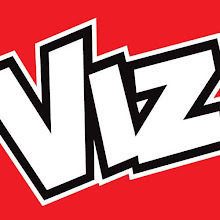 The only thing I don't like (that was even used by the Beano up until recently) is the fact that on some boxes they use grey outlines instead of black. 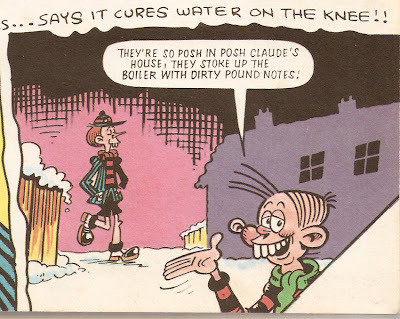 Of course, it's not as bad as some of the colouring that IPC attempted at, here's part of a Mighty Mouth strip from Buster 16th December 1989, drawn by Terry Bave to give you an example. Just a quick post - but I'm going to have a short blog break. It hopefully won't be for long, a week at the latest, so keep on checking back! 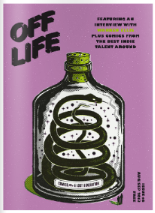 In the meantime, please check out the links to different websites on the side --> Cheers! I always liked reading the "Then and Now" sections of various old comics. Before I get into this one, I'd just like to tell you about a television programme I was watching the other day. 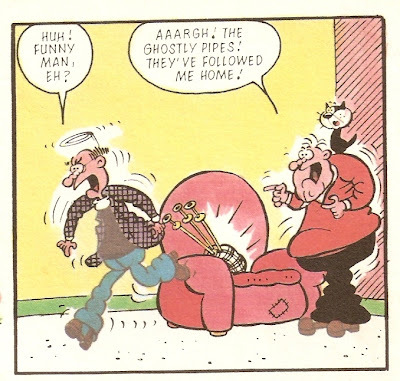 It was called 'Man about the House' (from around the same time as this Commando comic) and Larry was sitting on an arm-chair with a remote control, which was attached to the T.V.with a long, white wire! A classic example of how times have changed! 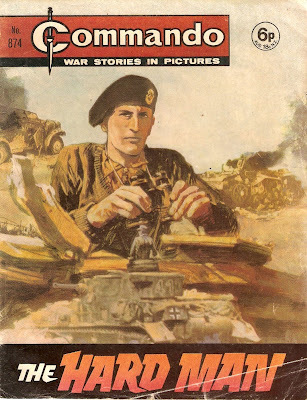 I thought I'd share one with you, so here's an example from a 1974 Commando book entitled 'The Hard Man'. 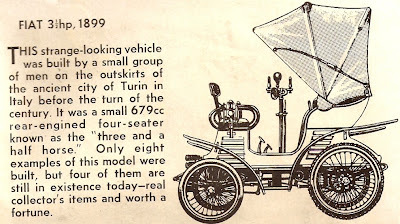 So, the 'Then' is a Fiat 3 1/2hp from 1899. And the now is a Fiat 130 Coupe, from 1974. 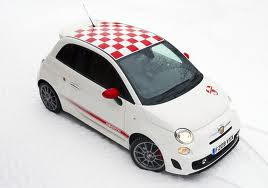 If this was been done today, it would probably be this car, The Fiat 500 Abarth SS. 12 Days Until Strip Magazine Released! 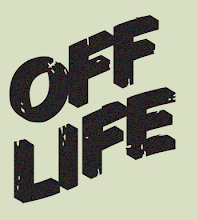 Brief post now! One of two new comics to be launched in the next few months, Strip Magazine will be first going on sale in the U.K. on 20th October! It doesn't really look like a children's comic (see issue two cover below), but will still be good hopefully enough. And besides, The Phoenix IS a children's comic and is to be launchd in January 2012! Let's hope they are both good and catch on! 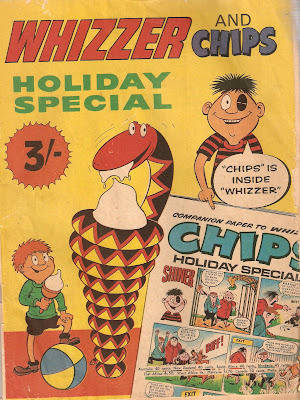 Happy Holidays with Whizzer and Chips! 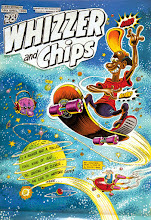 Whizzer and Chips was launched on 18th October 1969 (although I believe it was first sold in the shops on the 11th) entitled as 2 comics in 1! 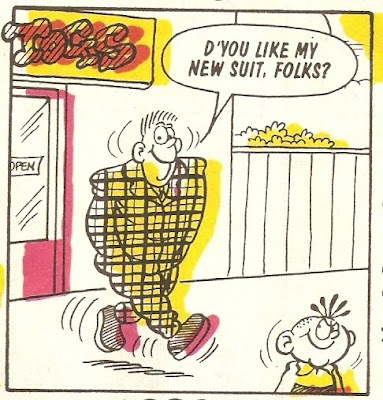 (However it was always regarded as one comic inside the walls of the Fleetway fun house.) It caught on and soon was being bought by millions of children and adults worldwide! Naturally, we would expect a summer special/ holiday special to come a few years later, but instead it came out the very next year! 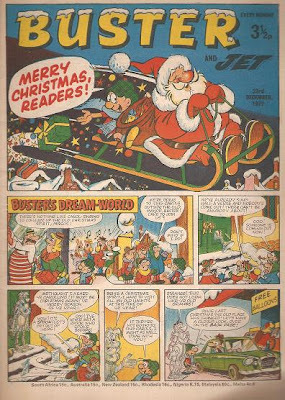 Buster's first Holiday special was 9 years after it's launch in 1969, the Beano's an Dandy's didn't appear on the shelves until 1965 - 28 years later! So it was a very big suprise to see one so early on (only a matter of months from the first issue!) So, did the rushed effort pay off? It certainly did! 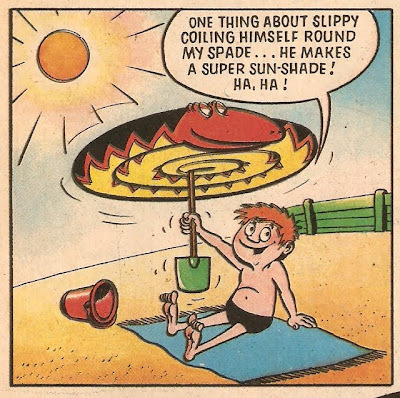 Champ, who has a pointed nose in the title box just like he did in issues 1 and 2, appeared in there, as did Ocky, Footsie the Clown, Wonder - Car, Me and my Shadow, Guy the Guide, Sid's Snake, Shiner, Spy - Smasher Smith (I believe this was his only Whizzer and Chips appearence) and many more much loved characters. Above: The first Whizzer and Chips holiday special from 1971. Since then the Summer Specials continued wonderfully right up until 1993 - three whole years after the end of the weekly! Buster's ran up until 1998 and the last trace I can find of a Dandy one is 2007. Above: The 1997 Buster Holiday Speaial. It's such a shame that summer specials arent still around today. I love reading my classics over and over again. Im sure they would be much-loved by many adults and children today and would still pass many bored hours in a small hotel room in Blackpool! 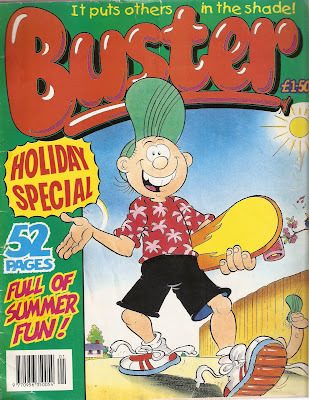 I know there are the Summer Annuals made by D.C Thomson but they're not really the same as a special 96 page comic. And besides, they cost £6.99 each, which I can't really see many kids forking out. 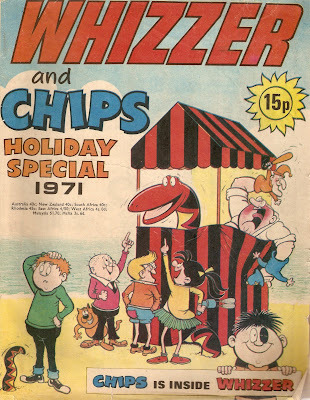 Above: The scarce 1971 Whizzer and Chips holiday special I picked up for just under £10. So, why are comics sales falling? The first and most obvious answer is of course video-games. There are so many ways to play these days, iPod, Xbox, Playstation, Nintendo (which I think might be in 3-D now) and even on the internet! Maybe a collection of still pictures on a sheet of paper just isn't good enough by today's standards? (I wouldn't know, as I've never payed even the slightest attention video games.) So, maybe this is the area comics need to aim for? An idea that occured to me not that long ago is something that I've been working hard on. 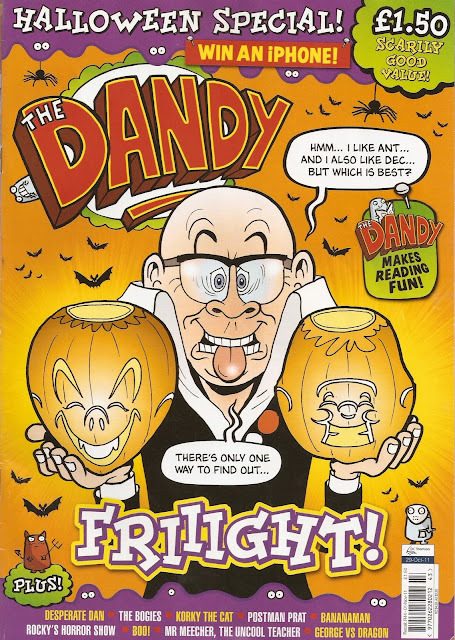 I asked a friend why he didn't buy The Dandy and his answer was "...I can't be bothered to go down and get it...". I'd just like to bring your mind to the Kindle. (In case you don't know, the Kindle is a virtual book type thing.) According to Amazon, they sold more Kindle's than they did actual books in it's first year! Maybe this is the same way too go with The Beano and Dandy? You could have something such as an E-Comic. You could pay for your subscription online and then be able to read it on your iPad or iPod. Maybe even on your phone so that you could take it too school. Maybe you could download it onto your television? Of course, it's all just ideas at the moment. Has anybody else got any? Pinch, punch, first day of the month! So, to start things off I've done a little revamp of my own! Well, what do you think of the new look website? For the moment it's only temporary (I'll take it off in a week's time) but if you like it and want it too stay please comment below! If you've the time, check out the different styles of the blog, including classic, magazine, snapshot and more! In other news - this week's selection of comics is on sale NOW! In The Beano Minnie the Minx stars in a play she was supposed to be watching, Dennis gets put into the cooler and Ed chews some gum in The Numskulls! 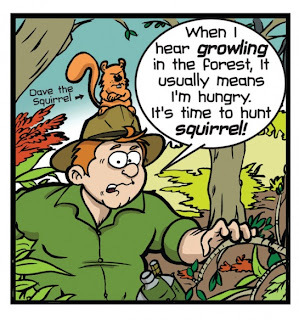 Meanwhile, Dave the Squirrel stars in the first of many in a new series called Ray Fears, drawn by Steve Beckett. Both of these fantastic comics are avaliable to buy today! Only £1.50!